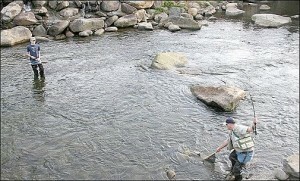 It’s springtime in the Smoky Mountains, and it’s time to go fishing! 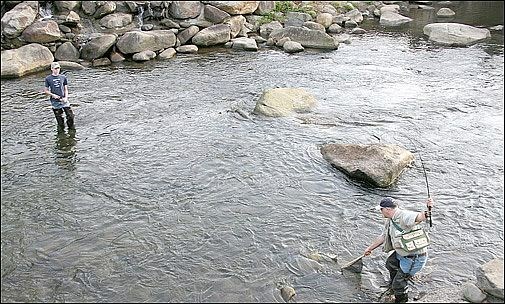 Saturday and Sunday, April 2-3, the largest trout tournament in the Smokies is held again, in over 20 miles of local streams stocked with thousands of trout. The 18th Annual Spring Smoky Mountain Trout Tournament is open to all comers, with prizes in many categories. Children are especially well catered to in this family-friendly event. There’s a children’s division as well as an adult division, and a tourist division as well as one for locals. Skilled anglers – or just plain lucky – can win a $500 prize for largest trout caught, but the smallest trout (at least 7 inches) gets its own $500 prize too, so the possibilities are endless for beginner and advanced fisher-folk alike. Other prizes and drawings include fishing equipment and trophies, as well as gift certificates and local attraction passes. Winners are judged by their total catch over the two days. The fishing starts 30 minutes before sunrise on each day, and weigh-in is at 4 pm on Saturday and 2 pm on Sunday – both times at Patriot Park in Pigeon Forge. Registration is required to enter, as well as a current Tennessee fishing license. You can register online at the Trout Tournament web page, by calling 865-661-FISH, or in person at either of the two local fishing outfitters, Rocky Top Outfitters (also the long-standing organizer of this event) in Pigeon Forge, and Smoky Mountain Angler in Gatlinburg. You can get a Tennessee fishing license online at the Tennessee Wildlife Resources Agency website. Only single-hook lures, and flies as bait are permitted in the tournament, with a 5-fish limit. For more information about Gatlinburg fishing in general, check our article Fishing in Gatlinburg – Where to Go, What to Bring. And when you catch your limit this weekend, think about where you’re going to cook those trout. Most of our cabins have outdoor BBQ grills on the deck – along with a hot tub for some serious after-tournament relaxing. Call us 24/7 at 855-91-SMOKY to book a cabin, or just to ask questions. Remember that we offer over $400 worth of Free Coupons for local attractions when you book a cabin with us. And always keep an eye on our Specials page for cabin discounts and deals throughout the year!